Having a Redtail Shark and Betta as tank mates seems impossible. However, there have been cases where it’s been done. If you’re planning on adding the two fish together then all hope is not lost. Keep reading to find out whether redtail sharks and bettas can live together, as well as the steps you can take to limit the amount of aggression between the two fish. 1 Can A Redtail Shark And Betta Live Together? 6 What Water Conditions Do Redtail Sharks Need? If you’ve been keeping bettas for a while then you know that they can often be aggressive to other fish, just like redtail sharks. However, luckily the two fish don’t swim in the same areas. While your betta’s territory will often be at the top of the tank, your redtail shark will prefer swimming at the bottom. The key to making sure these two fish can live together in harmony is making sure that there’s enough space between the two. As you know already bettas are surly fish that often have a bad temperament. So normally you’ll have to take this into account when choosing tank mates. And unfortunately, a redtails temperament is quite similar. If fish swim into their territory they become extremely aggressive. In fact, redtails can chase other fish around until they become exhausted and malnourished. But it’s important to know that redtail sharks will rarely attack or bite other fish. In fact, the chances are your betta will end up doing more damage than your redtail shark. Because of this, the ideal tank mates are going to be fast swimmers. But more importantly they can’t be too docile or peaceful, otherwise, the redtail will continually chase them. Fortunately, bettas definitely aren’t docile fish. Unfortunately, they can be TOO aggressive. Your first consideration when introducing a redtail shark and betta together is the size of the tank. Redtail sharks need plenty of room to swim around in, and without it, they are going to become stressed and aggressive. That’s why you’re going to need a large tank. Juvenile redtail sharks need at least 29 gallons and adults will need at least 55 gallons. As well as the size the shape of your tank is also important. Redtail sharks are very active swimmers, so you should make sure you give them a longer tank. This way they will have plenty of room for horizontal swimming. And your betta and other tank mates will love the extra space as well! As well as a large tank size you should also try to mimic the redtail sharks natural habitat. They are found in freshwater ponds in Thailand. To match this habitat you should add driftwood, rocks and live plants for decoration. You should also use the decorations to try and section off areas of your tank. Doing this is going to give your redtail shark a clear area to patrol. Once they’ve decided where their territory is, as long as no other fish venture there, they won’t become aggressive. This is one of the best ways you can stop your betta and redtail attacking each other. As long as they don’t come into contact with each other they should be fine. And once again, the bigger the tank, the better. A bettas diet is quite different to redtail sharks. Bettas prefer meat while redtail sharks prefer vegetation. If you’re buying a juvenile redtail shark vegetation is even more important. Without enough plants in their diets they will quickly lose their color, and if left too long will never grow to their full size. You should try to feed your redtail shark a mixture of frozen food, flakes, pellets, and live food. They love daphnia and bloodworms just like your betta so they’re the perfect treat for both fish. On top of this make sure you’re feeding them a mixture of vegetables such as zucchini, peas, cucumber, and lettuce, and if possible let some algae grow around your tank for them to graze on. If you’re going to feed your redtail zucchini, peas, cucumber or lettuce make sure to boil them and cut them up into small pieces before using them. And remember to vacuum the gravel or sand in your tank often to make sure you’re removing any rotten food. How Often Should You Feed Your Redtail Shark? Your redtail shark and betta can be fed at the same time, just make sure food is getting to your redtail. Bettas are extremely greedy and will carry on eating even when they’re full up. If you do plan on housing a redtail shark and betta together it may be worth buying sinking food pellets. Generally, you should feed your betta and redtail shark twice a day. Try to limit the time your betta is eating to about 3 minutes to make sure he’s not being overfed. And of course, make sure enough food is trickling down to the bottom of your tank so your redtail shark gets some. What To Do If Your Betta Is Eating Everything? If you notice that your betta is eating all the food before your redtail can get to it, there are a few things you can do. Feed your betta at one end of the tank, then drop food at the other end. Doing this is going to distract your betta meaning it won’t see the food dropping on the other side. This works especially well with sinking pellets and tablets. Trap your betta in a net and then feed your redtail. Due to the way a betta’s mouth is placed (upturned), it’s highly unlikely he will try to eat from the substrate. So you won’t have to worry about your betta encroaching on your redtails territory. What Water Conditions Do Redtail Sharks Need? There’s no point knowing all of this information then finding out that redtail sharks and bettas need different water parameters. And the good news is you’re not going to. 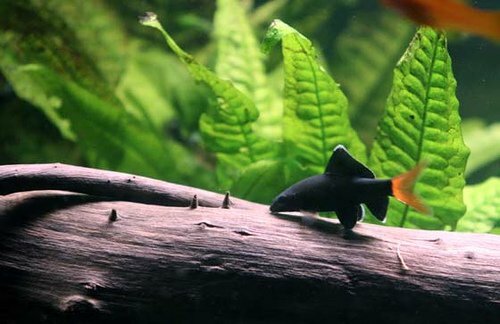 Redtail sharks can survive in the same environment as bettas without a problem. They are happiest when the water temperature in the tank is between 72-82°F and the pH is 6.8 – 7.5. A bettas ideal temperature (78°F) and ideal pH (7.0) fall nicely in between the redtails. Adding a redtail shark and betta is precarious, but it can work. Here are some of the ways you can increase the chance of your redtail avoiding your betta and being non-aggressive. Introduce a juvenile redtail shark, not an adult. If you add a redtail shark when it’s still a baby, your betta fish has a good chance of establishing it’s dominance over the redtail. Once this happens it is unlikely that your redtail shark will act overly aggressive to it later on. If you can, invest in a bigger tank. Redtail sharks need a lot of space, but the more space you give them, the less likely they are to attack your betta. While it’s important to give your betta a lot of horizontal room to swim in, you should also look for a tank with a lot of height. Bettas generally patrol the top of the tank while redtails lurk at the bottom. The more space in between them the less likely it is they end up being aggressive to each other. Help create a clear territory for your redtail. Set up a lot of natural decorations in your tank so that your redtail shark can choose an area as it’s territory. As long as your betta doesn’t enter the territory then it should be okay. Sometimes aggression will occur early between a betta fish and a redtail shark. So you’re going to need to keep a close eye on the situation. If things don’t seem to be improving after a couple of weeks or if either fish seems to be stressed, you’ll need to move one of them to another tank. Both bettas and redtail sharks are able to jump out of your tank. So make sure that you cover the top of your tank completely so there’s no way they can get out! Just like bettas, you should only have one redtail shark in your tank at a time. If you add more than one, or any fish that looks similar they will end up chasing each other. There are times when you can have multiple redtail sharks, but you’ll need an extremely large tank. And this should only be done by experienced fish keepers. If you’re desperate to keep redtail sharks and bettas together it can work, but it’s going to depend on the temperament of both fish. Make sure you have ample room in your tank for your redtail shark. An adult is going to need a minimum 55-gallon tank. While it’s unlikely a redtail shark will ever outright attack your betta, he may chase him until he becomes extremely stressed. When it comes to feeding, betta fish are a lot more carnivorous than redtail sharks. So make sure your betta’s getting a more meat-based diet whereas your redtail shark will need a more plant-based diet. If your redtail isn’t getting to the food quick enough try using sinking pellets, as well as feeding the two fish at opposite ends of the tank. The best way to prevent your redtail shark from chasing your betta is by trying to section off some of your tank. If you use enough natural decorations you can cordon off an area that your redtail shark will want to patrol. As long as your betta doesn’t enter this area then they won’t attack each other! 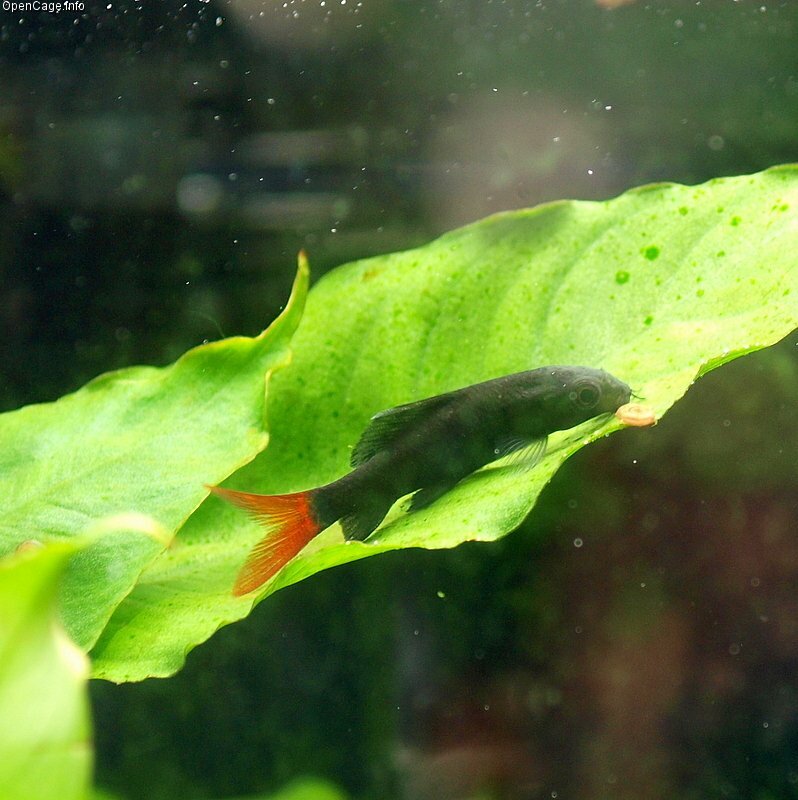 Tetras – Unlike redtail sharks, you definitely won’t need to worry about tetras being aggressive. And their quick speed means it’s unlikely bettas will attack them. Snails – Having snails in your tank is an excellent way to get rid of some algae. And if your betta absolutely hates fish, you may still be able to get away with adding a few snails to your tank! Platies – If you’re looking for something colorful, but not something that’s going to attract too much of your bettas attention then platies are great. They’re extremely friendly, and the only thing you’ll need to worry about is the fact that they’re livebearers. However, it’s just more food for your betta!